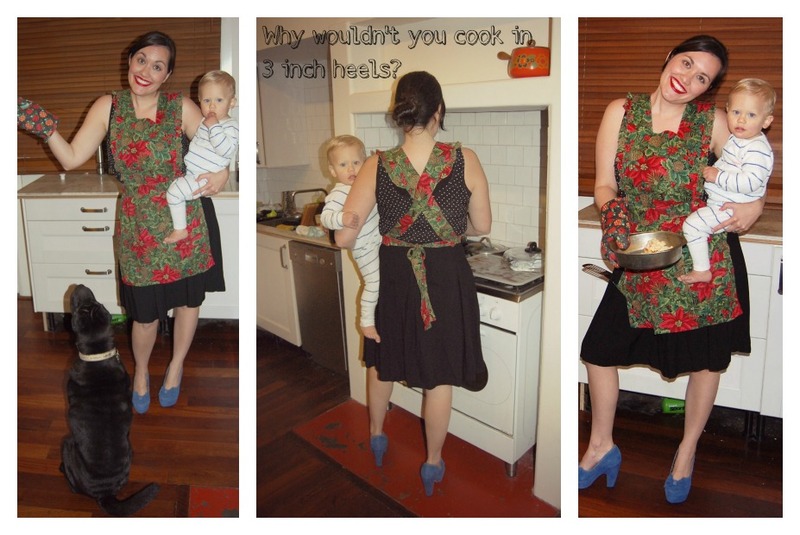 Why yes, I always look like this when I am making dinner. Don't you? I've just reached the end of my first year as a Stay at Home Mum. I think I was probably more adjusted to staying at home that most new Mums because for two years previous to becoming a Mum I worked from home, and have been studying externally from home too. So I am used to the solitude, what I was not used to, was having my day dictated to me by a very demanding, occasionally overbearing, but extremely cute and energetic little boss man. There are some days that I think having someone else deal with nap time and teething during the daylight hours would be preferable (if I am throwing out ideas lets say the night time hours would be amazing too). There are some days where I feel like wearing heels and going to the toilet alone (lets try to see how many people and animals we can fit into the small toilet cubical shall we, that sounds like a fun game). There are some days where I long for conversation that doesn't include the word 'dad dad dad dad dad' repeated to me at least a million times a day. There are a lot of days where I loathe doing any more housework that seems to mysteriously undo itself by mid afternoon. Occasionally I get bored, there is only so much vacuuming a person can handle in a week. Some days the pajamas stay on, the shower is a distant memory and my hair is a grease ball. Sometimes I feel out of touch with the 'real' world, wait, so neon is fashionable again? Dang it, I should have kept my clothes from the early 90's. 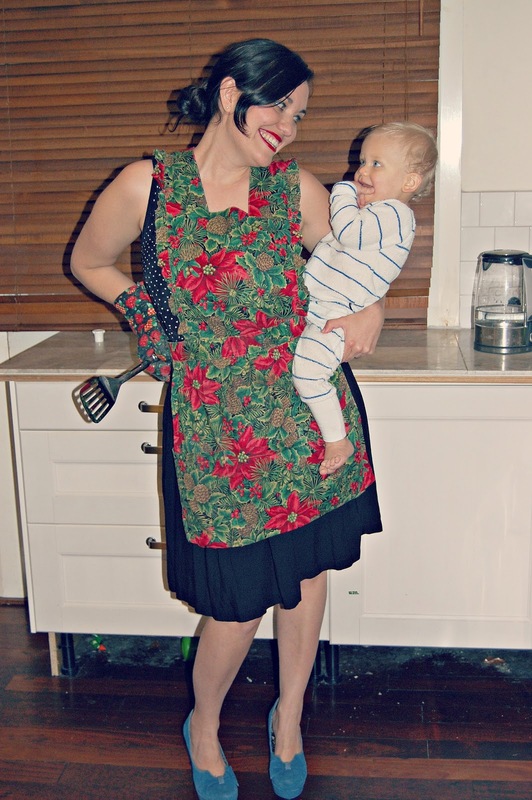 As many of my new Mummy friends are starting to head back into the workforce it has caused me to do some reflecting on my status as a stay at home Mum. It is definitely easy to think that I should be doing something more, contributing more, helping to pay the bills, getting ourselves ahead, earning more money. Then I remember how much I really love being at home with my little man. I think of how very lucky I am, so many people would love to have the option to be at home, but just can't. My life isn't really glamorous, most of the time the opposite of that. When I look into those big bright blue eyes and think, I don't care about any of the other stuff, I am just glad you call me Mum (occasionally, most of the time you call me dadadadadada). Here are some things that have helped me to Survive and Thrive as a full time SAHM Mum. - If your having a hard day (i.e.baby won't nap, screaming, won't let you change a nappy without smearing poop all over you and the floor): go outside. The sun and fresh air does wonders for cranky babies and Mummies. - Get involved in the community. Lots of places have things for babies/toddlers and parents. Like library baby rhyme time, toddler gym. Even most of the indoor play centers near us are free for under 1's. - Have a hobby: For me blogging has actually been a great outward release of my energy and something else to focus on and I really enjoy it. I think that it helps to have something for 'you' that you enjoy and look forward to. - Ask for help. I was just talking to a friend about this today. You don't have to be superwoman, and you don't have to do it all yourself, it is ok to admit that it is hard and your struggling. Also side note! I think it is important if you have the means to, then do whatever it is that works for your family, I stay at home, and I love it, some people hate it, so no judgement here, nobody wins when Mum is miserable. 21 comments on "My first year as a SAHM"
Yes as a stay at home home we have our good days and our bad ones. I was a SAHM for about 3 years then went back into the work force. That only lasted about 6 months, I missed my girls and I was a nut case because I could never get anything done! That's when we decided that I become a WAHM! It's perfect and I love it!! I love this! That first photo made me smile. End of my first year as a stay at home mum is looming also...and so comes the relentless question "When are you going back to work?" Part of me wants to, most of me doesn't want to...I keep imagining missing all these milestones while I'm away! I LOVE this post! It's like you just described the last 8 months of my life. Now that I am back at work (albeit very part-time) I do miss being there every day, but at the same time there is a small part of me that enjoys not having to deal with the first nap of the day three days a week! And teething! I thought getting a newborn to understand night and day was hard but that's easy compared to sooky, grumpy, whingy, teething baby! One thing I have been meaning to do is go to our local library and see what sorts of things they have for kids so thatks for the reminder. I'm not in a mother's group but only because I have a couple of good friends with kids who I tend to catch up with and hang out with so that fills that need, and I was going to a Mum's & Bub's yoga and morning tea group for a while which was good too. P.S I LOVE those pics! Gorgeous! I can imagine that it would be pretty impossible to get everything done! It is great that you have the option of being a WAHM, that is definitely a hope of mine! Yeah I can tell you love it by your blog!! Your enthusiasm is contagious! i love being at home with my kids.. but I miss the social atmosphere of working.. I think I reclused myself when I found there wasn't much for me to do around here with my kids.. I may have to venture out and see what there is..
Yeah, your right, the same stuff definitely applies for working Mums!! Thanks for stopping by! TEETHING arrrggghh the bane of my existence right now. I would take the not sleeping part over that sometimes for sure. Yeah our library has heaps of kids stuff going on, so does the local council, it is amazing what you find when you start looking! and thanks, I had fun taking the pictures, its nice to dress up and be silly sometimes!! I think it is so easy to be a recluse, I have had to work hard not to be, but sometimes I still am. Check out Buggybuddys.com.au they have a list of heaps of stuff that is happening around our city on a daily basis!! Thank You Kevin!! I find a lot of people don't understand how important and exhausting it is!! I love meeting other parents and bubs in our area, makes me believe that the spirit of community is still alive and kicking in Aus! I'm in my 2nd year of SAHM-ness and I think I've finally found my groove. I love how I don't have to stress about douchebag bosses anymore and instead spend my days with my very special boys. haha so true Grace, it is so nice to not have to worry about someone else expects of you on top of everything else!! one of the best things for me was when I started being the SAHM for other kids who didn't have their own to claim. It was great having our house the hub of activity. Science projects built on patio and in basement--if you don't mind losing a few parts of your old vacuum cleaner. I liked your pics--reminding me of all the 50s ads and cook book illustrations of perfect picture women I saw as a kid. Great grandma Lipper never looked like those peers--but she sure could cook, and love, and come up with a 1000s fun ways to entertain me and my friends! With the media we embrace now, it's hard to see anyone focusing on perfect picture hearts--but that's what SAHM need most-- BTW--on reading--soon you'll find yourself graced by those wonderful years of reading together--we did it for years! Then Ezra and you will know the same characters, and being lost in a book will take on new meaning as you reference things together and draw on quotable quotes. It's also coming on those great times to read poetry and do the action stories from the Bible--like bringing down the Jericho walls! Good luck going 'round 7 times quietly, though. I can still remember the big white kiddie-literature book my mom had from her college days--that was my favorite source of read-aloud material from her. She'd bring it around, esp if i had to stay home from school, ill. Kipling's--elephant with 'satiable curiosity' the earliest story I can remember my mom reading to me.... go for it! I'm proud of you, investing in another generation of great memories.